A French collection of recipes for painting on parchment, On Making Colours, by a painter, Peter of St. Audemar, possibly of the Benedictine Abbey of St Bertin at St. Omer in northern France. 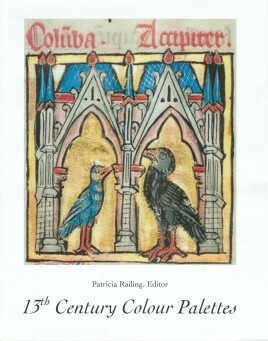 St. Omer was an active centre of painters and scribes from the end of the 12th century and from it probably came The Aviary / De avibus by Hugo de Fouilloy (c. 1140) in the so-called Gloucester copy which is dated 1277. Plates and illustrations have been included in this handbook, bringing together a treatise and a book which may have derived from the same place, an exceptional event in the history of pigments. Notable is the reference to painting in oil on panel, artists of the French school responsible for the London, Westminster Abbey Retable of 1280, also painted in oil on panel.